When Jessica and I became acquainted I could tell right away that she was very knowledgeable and meant business. She was serious about helping women put their best foot forward in clothes they could feel truly beautiful in. After asking me a few questions about my size, preferences, ‘trouble areas’, and favorite colors and patterns, Jessica selected two outfits for me that I absolutely love!!! 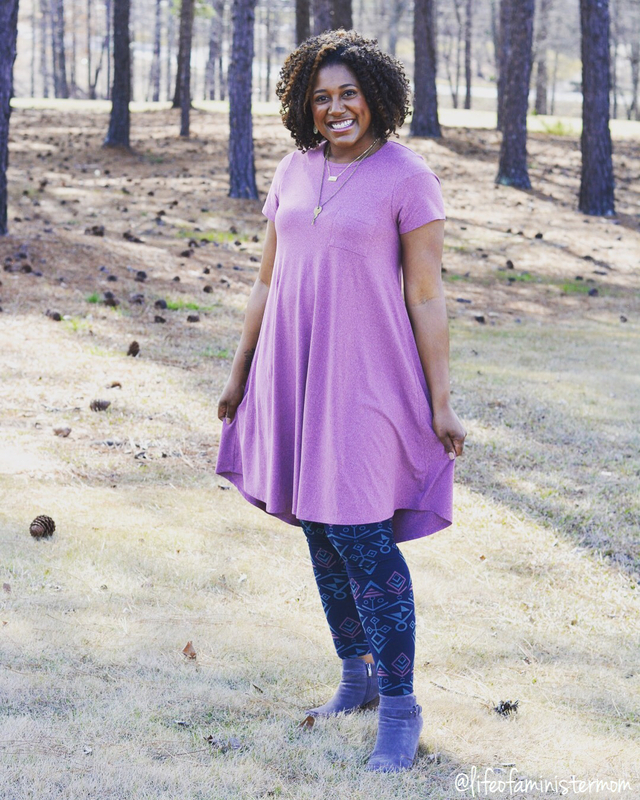 I knew from my first LuLaRoe experience that the Carly was a must, and this purple color is so pretty! You know those shirts you end up buying in every available color? Well, I feel like that’s going to be me and this dress! I honestly love wearing dresses but I feel a lot more self-conscience these days. The Carly is flattering, the perfect length and it can be styled in so many ways! I paired it with some LuLaRoe leggings and my go-to booties and was set! I know, I know. There’s so much hype around these leggings but I’m beginning to understand! Let me tell you that the first thing that impressed me was the fact that they even have a ‘tall and curvy’ size. I’m a curvy girl so I’m always a bit hesitant about the leggings route, but these fit me so well!! They didn’t ride up or slide down, or cut off my circulation. And they are soooooo soft! I kept telling my husband to feel how soft they were, lol, because I couldn’t believe it! Since I was on a roll with my new LuLaRoe items, I decided to wear my second outfit to church on Sunday. This time it was a Classic T and Sarah duster. At first I was a little uncertain about the Classic T. I didn’t know if the fit or shape would be flattering, but when I put it on I was hooked. It fell right into place and looked really cute with jeans. Once I added the Sarah I felt a bit more polished for Sunday service and this pattern is amazing!! 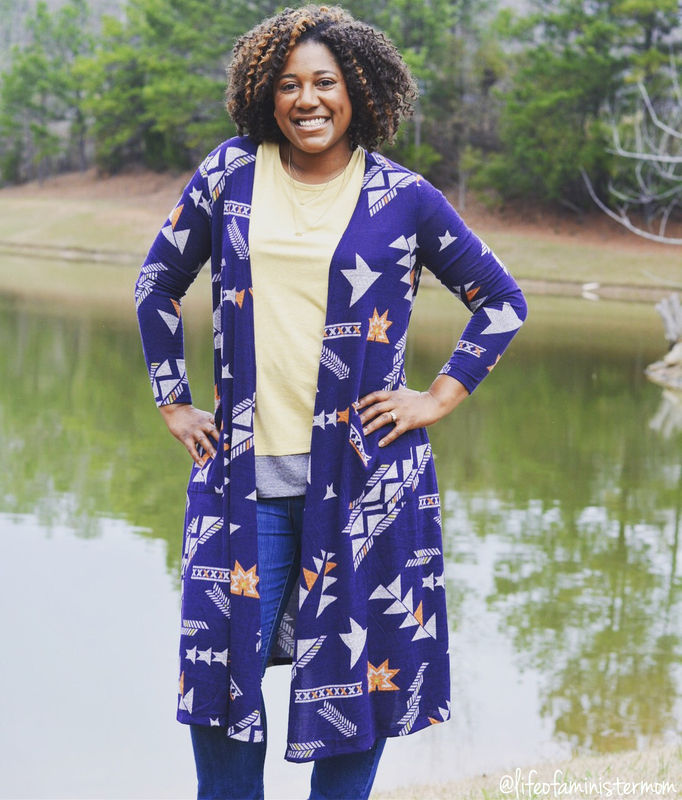 I love all things cardigan so this one was definitely a no brainer!! Jessica hit the nail on the head with the styles, fit and patterns she selected for me. She has great inventory and super shopping opportunities in her Facebook group, and she keeps it fun in there as well! You’ll want to stay up to date with her on Instagram too, and right now we are hosting a giveaway!! Visit my feed for your chance to win a Sarah duster of your choice! Jessica will also be debuting them in her group this weekend, so don’t miss out!! I hope you all had a wonderful Valentine’s Day! 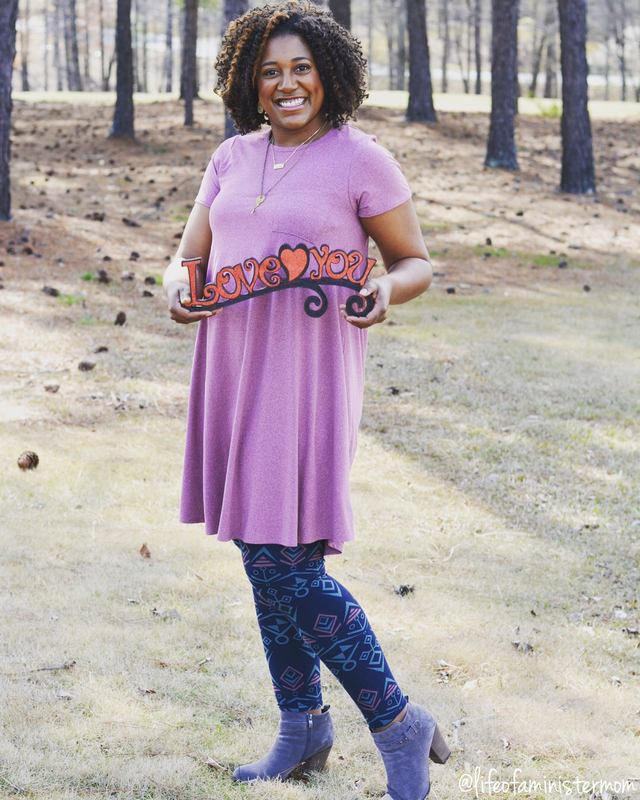 Tell me, what do you love about LuLaRoe? Soooooo cute! You rocked this! Thank you very much Amanda!!! Those are my favorite styles as well. You look fantastic! I love the Sarah you’re wearing, and now it’s my new unicorn! Thank you Denice! I love it!!!! I’ve only recently tried it but it’s definitely something you’ll want to mark off your list!! Looking great! I love how easy it is to dress it up or dress it down. I love that about their styles too!! That purple, definitely your color! 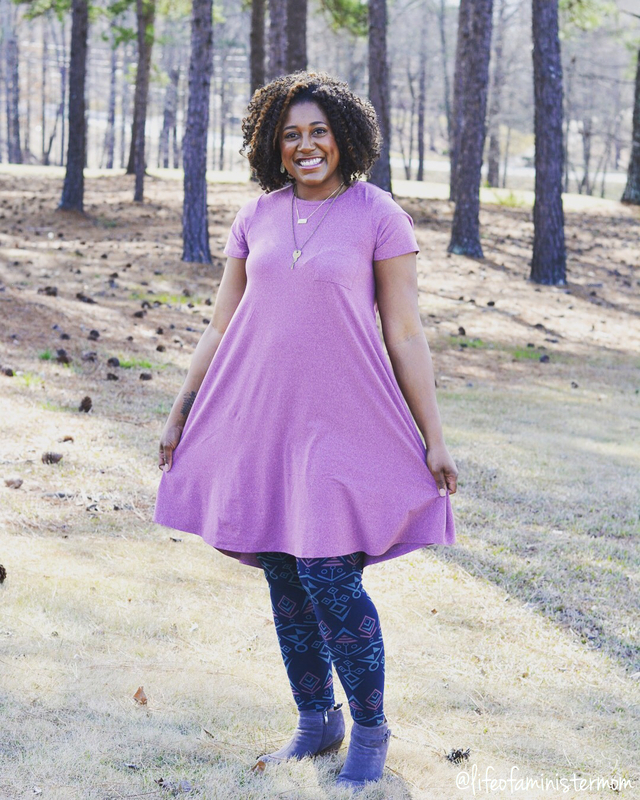 I am obsessed with lularoe now, the leggings, the Carly, the Sarah, the Irma, all of it! I haven’t tried the Irma yet. I must get to it!! Purple looks great on you!! I am new to the LuLaRoe craze. I went to a party my neighbor was having but only bought leggings for my daughter because it was around Christmas and then my sister was nice enough to buy me two pairs for Christmas and I love them. So comfy!! I have never seen the Sarah duster but am in love!! Thank you Kelli! I haven’t purchased anything for my daughters but that might need to be my next move! I haven’t tried Lularoe yet. I’ve heard good things though. You look so cute. That color purple is great on you. Thank you very much Dawn!! I have a couple of piece that are lularoe and I love them each. Super comfortable and make you feel amazing! Yes!! That’s exactly what I love about them!!! I recently discovered Lularoe too and love it. The colors look great on you! I cant get enough of their leggings! Thank you Angela! And their leggings are so soft!!! That Carly and Sarah are TOO CUTE! I don’t have those styles in my collection yet but they’re on my list! I love both these styles so much!!! I love that dress on you, It like so comfy too! And those booties!! I am the ultimate lover of LuLaRoe! I wear it all day everyday! I love how you styled your carly, those leggings are gorgeous! Thanks so much Krysten! I must add to my collection!! I love your pretty Valentine’s outfit. The color looks great on you. I love the cardigan as well. Great outfit on you!! Thanks Angela! I appreciate that so much! The outfits are so cute and I love your hair. They look amazing on you! 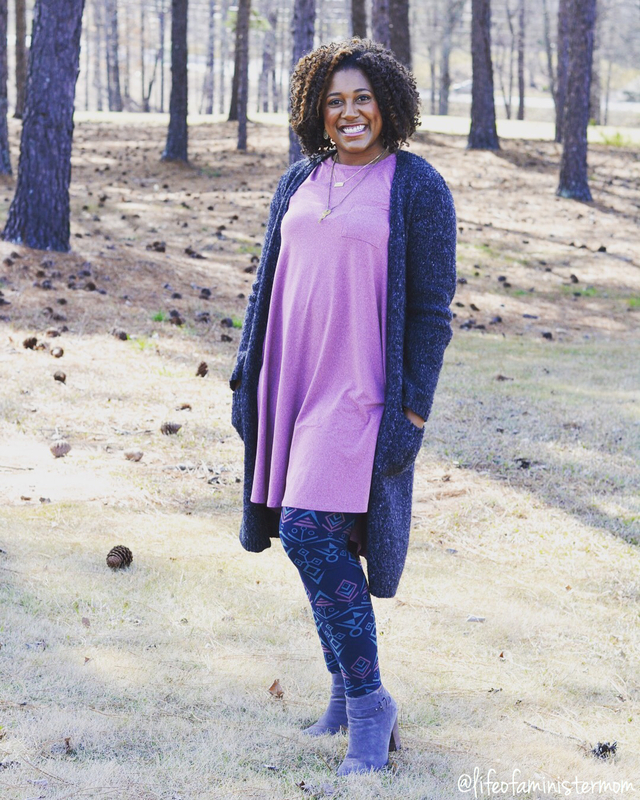 I love how comfy and versatile Lularoe is! That’s one of the reasons I love it too! You look gorgeous in these! I haven’t jumped on the LLR bandwagon yet but I think I am about to. My experience is recent, but it’s been great so far! 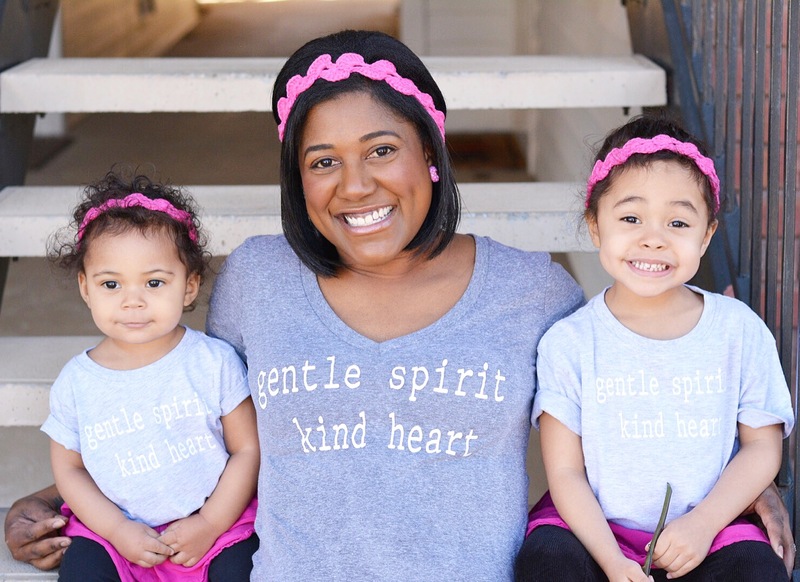 You are adorable and these styles look great on you! I have not succumbed to LLR yet but you make it look fab! Thank you Lisa!! I resisted for a while but I’m so happy I’ve tried it now! I heard a lot of good stuff about Lularoe. I think i need to try my hands on them one day. I love the dress . I heard about Lularoe product but never owned one..I think I need to try it. You should definitely give it a try Anna!! Thanks for reading! That duster looks great on you! I have a LuLaRoe maxi that I love!! I need to try the maxi too!! You look so lovely and full of joy. Happy Valentine’s Day . Thank you Candice! You’re so kind!! Love the pattern on that duster! This looks so comfortable and you look great! Thank you Vicki! When comfort meets something I feel fashionable in it’s a win win!! So pretty, I love these pieces!! You are gorgeous! I am currently so obsessed with LuLaRoe! I love my leggings and Randy! I REALLY want to get some for the girls. Did you get your girls any LuLaRoe? The Randy? There’s another one I haven’t tried yet! They have so many great options and I’d love to get some for the girls. You look great! I love their stuff! Soooooo silky soft smooth fabrics! Im wearing my flamingo leggings right now! I love the pattern on that cardigan!! Both outfits look great, but I really love that purple color on you! So pretty! I agree about their leggings, I finally get the hype, lol! Thanks Justine!! And yes, the leggings are smooth like butter! Lol. Lol. That legit has me laughing because I’d do the same. Lol. But at least we’d look cute as we tripped over ourselves!!! The Sarah is fabulous but I haven’t tried the Monroe! Now I’m excited for something new! I actually adore that cardigan! You are just the cutest thing! Um hello gorgeous, seriously these outfits look amazing on you! I need to get on board with this, I mean even my mom knows about these leggings! Haha!! The leggings really are amazing. Thank you friend!